We've all met children trapped in "grown up" bodies. I dare say it's never a fun experience. You may not be a compulsive analyst like I am, but I can't help but ask, "What keeps these people from becoming adults?" Then I ask, "Well, what is an adult?" Does adult mean "old person" or "person over 18 years old?" These questions help me self-reflect. "Do I act like an adult?" I'll be very transparent. Throughout my 20s, I felt like a teenager masquerading as an adult. 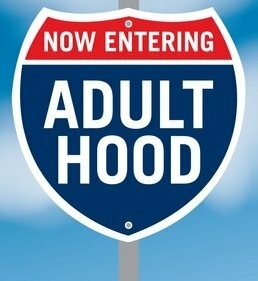 I often felt like I wasn't ready to take on major "adult" roles and make big "adult" contributions. Sure, I could do stuff; but it didn't really matter that much (in my mind). I perceived myself as an underling. But when I turned 30, something smacked me in the face. Whatever that something was, it said, "Hey! You're an adult now. Act like it." And then I immediately decided I would only wear boring clothes and never laugh at jokes again--ever. Adults are not soulless, work-mongering automatons that just follow rules and avoid excitement and fun. Something must be different! Adults are not children. As I thought about my new found call to adulthood, I came up with a list of things that separate the men from the boys (or the women from the girls). It's not necessarily our clothing styles or the monotony of our daily routines. 1. Adults serve other people. Adults serve their children. Adults serve their spouses. Adults serve their coworkers, their friends, and even a few of their nemeses. Being an adult means that you realize you're not the center of the universe. You're not the reason life exists. You are not here to receive. Does this mean you never let anyone do anything for you? No. Let's not be stupid. Let's be rational. As I've grown closer to God and learned about His call for my life, I've found a deeper, stronger desire to help and serve other people. I'm not doing it to earn a trophy or to impress you; I'm doing it because I want to be more than a large-bodied child. Acts 20:35 ...Remember the words of the Lord Jesus, how he said, "It is more blessed to give than to receive." Matthew 20:26 [Jesus said,] "Whosoever will be great among you, let him be your minister." 2. Adults keep their word. Of course there will be times when you simply cannot keep your word. Perhaps the flu incapacitates you, or the wheels fall of your car on the way to said obligation. You're off the hook (sortof). But again, let's be realistic. Most of the time people don't keep their word, it's because they are lazy, forgetful, selfish, or all of the above. That includes me. There are two remedies for this. A. If you don't want to do it, don't agree to do it. Most people would rather here "no" up front than hear "yes" and then get "no" later. B. If you agree to do it, do it. I wasn't born in the 1950s, so I can't talk about the good 'ol days when everyone was moral and kept their word (spoken sarcastically, please understand); but I can talk about today and tell you that people still value reliability. If you regularly shirk responsibilities, show up late, or miss obligations, you are acting like a child. Stop that. Colossians 3:9 Lie not one to another. 3. Adults commit to worthy causes. What has always amazed me about children is the fiendish ability to forget unpleasant responsibilities but remember with laser-like focus those things that they enjoy. They can remember intricate details about every level of their favorite video game; they can faithfully watch every single episode of their favorite show; they can always remember to remind Mom or Dad to get their favorite food from the store. But if the cause is something outside their bubble of desire, it's as good as dead. Yes, I'm exaggerating to make a point. But really, we're all kids at heart. We all do this. I could be the world's worst. We're all committed to something. The question is, "Are your commitments worthy of your time?" James 4:14 For what is your life? It is even a vapor that appears for a little time and vanishes away. Ephesians 5:16 [Redeem or "make good use of"] the time, because the days are evil. 4. Adults don't give up when they're frustrated. Right now my 3-yo son is going through the phase of getting frustrated and quitting. If he doesn't immediately find success, he wants to quit. That's natural, and I'm not very hard on him about it. He's 3. But I'm not 3, and I bet you aren't either. I get really frustrated, and sometimes I have to leave something alone for a little while and come back to it later. That's not giving up; that's taking a breather. But after your breather, get back at it. Quit quitting. Finish. Perhaps your frustrated with your marriage, a friendship, a work situation, or something at your church. The solution is not quitting. If you plan to be an adult, you need to stick with it even when it's not exactly what you wanted or expected. Maybe, just maybe, you could make it better by putting some effort into it, by supporting the other person, by exercising some self-sacrifice, and by being reliable. Proverbs 24:16 For a just man falls seven times, and rises up again. 5. Adults face their fears. We should all jump into a dark room full of snakes and scorpions to graduate to adulthood. Some of you might think that's a relatively painless alternative to your current predicament. Taking a leadership role can be frightening. Getting married can be scary, as can having your first child! Public speaking can be intimidating. Starting a new job/career can put your stomach in knots. Meeting new people can be unsettling. Challenging long-held ideas can be petrifying. And every single one of these things has been a rewarding experience for me! Isaiah 41:10 Fear not, for I [God] am with you. Be not dismayed, for I am your God! I will strengthen you. Yes, I will help you! Yes, I will uphold you with the right hand of my righteousness. 6. Adults accept leadership responsibilities. The child in all of us wants benefits without responsibility. We want pleasure without pain. We want our cake without making it. Every adult has an opportunity to lead. You might lead in the nursery, in a day care, in a school, in your family, among your friends, at your job, in your church, in your book club, or anywhere else you interact with people. Occasionally you will be asked to take some responsibility. Instead of focusing on how much of an inconvenience that will be for you (childish perspective), focus on how much you can help and serve the people you're leading (adult perspective). The enemy of leadership is excuses. If you always have a reason why you can't take the lead, you're acting like a child. Stop it. The difference between the good and the best has always been initiative. A good employee does what he/she is asked to do, while the best employees think about ways to improve things and make their workplace better without being asked. A good husband does what his wife asks of him. A great husband knows what his wife wants before she asks and takes action to make her the happiest woman alive. And of course I'd be lying if I said that I always take the initiative! I don't. I regularly face palm myself for standing idly by while opportunities pass. It happens. Learn from your mistakes, and let them motivate you to take some initiative the next time opportunity comes your way. Colossians 3:23 Whatever you do, do it heartily; as unto the Lord, and not unto men. Well put! Welcome to adulthood!